A stroke happens when blood flow to a part of the brain stops due to a blockage in the blood vessel (called a blood clot). 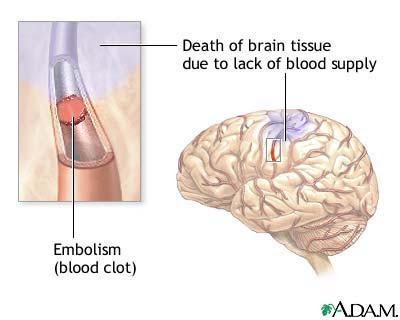 If blood flow is stopped for longer than a few seconds, the brain cannot get blood and oxygen. Brain cells can die, causing permanent damage such as cognitive problems, paralysis, speech defects, and vision problems. It is the brain's version of a heart attack. Diabetes is caused by a problem in the way the body produces and handles insulin. Insulin is needed to move blood sugar (glucose) into cells, where it is stored and later used for energy. According to a study in Stroke, an American Heart Association journal, the longer a person has diabetes, the higher the risk for stroke.